Created in 1987, ARTTIC is a European provider of management services, especially in the area of large international collaborative R&D projects. ARTTIC has several offices based in France, Belgium, Germany, UK and Israel. 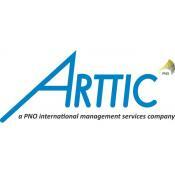 ARTTIC is an SME with a total workforce of about 60 people. ARTTIC provides specific and practical help with all aspects of international R&D projects, taking charge of all management aspects of running projects and helping to disseminate and exploit project results successfully. ARTTIC has a 27-year track record in management of international R&D collaboration projects in various scientific and technical domains. In the field of Life sciences and Health, ARTTIC has been involved in the management of 27 projects of Framework Programmes FP6 and FP7. In SECURE, ARTTIC will support the project coordinator by providing the day to day project management tasks. ARTTIC will also lead the dissemination work-package and contribute especially to the preparation of dissemination material and communication activities. Adeline Paul, Project Manager. Adeline PAUL has been Project Manager at ARTTIC since 2012. She has a Master’s degree in European Projects Management with a specialisation in Research and Innovation from the University of Cergy-Pontoise, France. She has been involved in the management of FP7 projects in Health (FOCUS, supporting CNIC as Coordinator), Rail Transport (MAINLINE) and Energy (ADDRESS). In addition to SECURE, she currently manages an Aeronautics platform funded by the French "Investments for the Future" program – PIA (EPICE). She also regularly participates in proposal writing and negotiations, mainly in the Health sector (previously in FP7 and now in H2020). Carlos Triay, Senior Consultant. Carlos Triay has worked with ARTTIC in Paris since June 1996. He holds a Bachelor of Science and a Master of Mechanical Engineering Degrees from Cornell University, Ithaca, New York (USA). He is experienced in co-ordinating large networks and projects of technical and scientific experts in the fields of health, transportation, nano-technologies, high performance computing, e-learning, e-commerce and smart cards. He worked for Bureau Veritas in France from 1989 to 1996 on its Research and Development Centre, for the Industry International Division, and for its R.A.M.S. unit. As a Research Engineer, he worked on National and International Projects concerning non-homogeneous materials and computer simulation and modelling. He worked in the past for McNeil Company (1985, 1986), a subsidiary of Johnson and Johnson, on the qualification and certification of pharmaceutical equipment and installations in Las Piedras, Puerto Rico, and with Bermudez & Longo (1987), an engineering firm in Puerto Rico, where he managed projects aimed at the upgrading of waste water treatment plants.